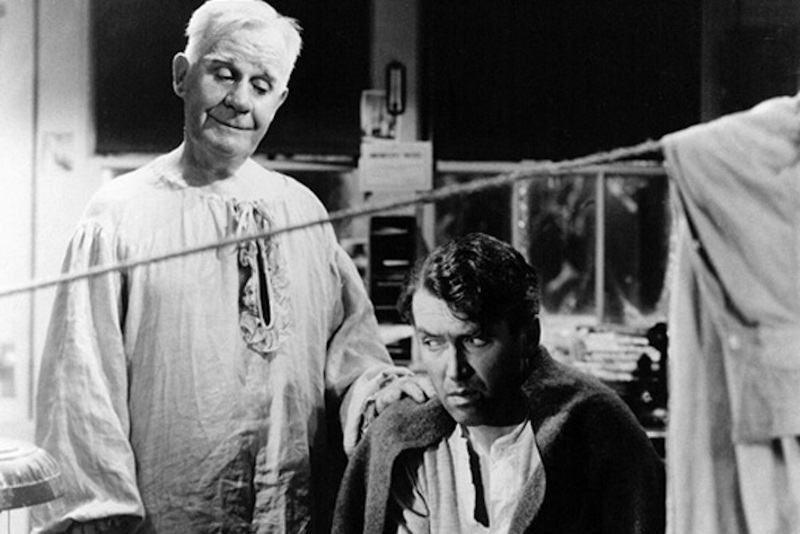 The angel Clarence Odbody, played by Henry Travers, counsels Jimmy Stewart’s George Bailey after his suicide attempt. Courtesy of Wikimedia Commons. Critics sometimes said the revival was only an inch deep, more a matter of religiosity than actual religion. The sociologist Will Herberg found that four out of every five Americans affirmed the Bible was God’s revealed word, but that, when questioned further, only half of them could name even one of the Gospels. When these religious themes showed up in postwar movies, they were usually non-doctrinal and uncontroversial, blending easily with familiar bromides about the American way of life. In It’s a Wonderful Life, for example, Jimmy Stewart’s character George Bailey is immensely likeable. That’s not surprising, because he’s an American stand-in for Jesus. His story never seems like a religious film on the surface but scene after scene has a religious subtext. The George Bailey we get to know and admire nurtures the community, lives a life of self-sacrifice, resists temptation, and stands up to evil. Where Jesus healed the sick, young George rescues his drowning brother and saves an innocent man from poisoned pills. Where Jesus preached in parables and lived in poverty, George teaches the townspeople lessons in civic decency and gives away his honeymoon savings before going to live in a ruined house. Jesus saved Mary Magdalene from a life of degradation; George saves Violet, the town’s bad girl, from a similar fate. The biggest difference between them is that George gains redemption without having to suffer a humiliating and agonizing death. At crucial moments he also enjoys the help of two angels. One is the goofy trainee Clarence, who’s been trying to win his wings in Heaven. The other is his wife Mary, who fully lives up to the old ideal of the Angel of the House. Mary reconciles him to a humdrum life of service in Bedford Falls in place of the adventures he’d dreamed about. Clarence shows him how much worse the place would have been had he never lived. The Devil, in this scheme, is played by Lionel Barrymore in the role of Mr. Potter, the town’s greedy banker. On his desk stands a paperweight in the form of a skull. The Devil is a tempter, who offers George $20,000 per year to run his business. Our hero almost succumbs but then, like Jesus tempted in the wilderness, finds the inner resources to say “Get thee behind me, Satan.” But It’s a Wonderful Life doesn’t ask viewers to criticize the American economic system. Never mind that the actual Jesus overturned the tables of the moneylenders and said it was harder for a camel to pass through the eye of a needle than for a rich man to enter the Kingdom of Heaven. In this allegory we’re asked to sympathize with the small-town banker, a modestly affluent man, as he stands up to the big heartless capitalist, whose only motive is greed. The sociologist Will Herberg found that four out of every five Americans affirmed the Bible was God’s revealed word, but that, when questioned further, only half of them could name even one of the Gospels. You don’t have to be aware of these religious parallels to enjoy the film, and its makers seem to have done all they could to avoid actual religious controversy. No scenes are set in church and the characters scarcely even mention religion. Heaven itself is depicted, in a deliberately cheesy sequence, as a set of remote galaxies that scintillate as God and his assistants discuss George’s plight. One aspect of the post-World War II revival was the attempt to assure Americans that religion was not a terrifying higher reality, not a matter of wrenching anguish, salvation, and damnation, but a set of familiar all-American activities. There was no room here for the angry God of the Old Testament, no welcome for Jonathan Edwards and “Sinners in the Hands of an Angry God.” Instead it was an age of religious comic books, evangelists singing country music songs, folksy TV preachers, and God-fearing athletes saying a prayer after the touchdown. The money that saves George, given by all his friends and acquaintances, has more the feel of a Christmas present than a sign of divine intervention, though the film suggests it’s really a bit of both. In any case, it’s George’s reward for a lifetime of dedication and service to the town. Now that he’s seen the horrible alternative, he’s delighted to find himself there. It’s difficult to remember today just how sharp American anti-Catholicism could be before the 1960s. A best-seller of 1949 was Paul Blanshard’s American Freedom and Catholic Power, which argued that Catholicism, like communism, was a sinister form of mind-control, the antithesis of American liberty. Even 11 years later the Catholic presidential candidate John F. Kennedy was still having to reassure voters that, if he won the election, American policy would be run from the White House, not from the Vatican. There’s no sign of such ideas in the film, however. One of its cheery interludes, designed to show us George at his best, follows an Italian immigrant family moving from one of Potter’s rental slums to a dignified little house of its own. A generous loan from George has made it possible, and he now drives the whole family, complete with pet goat, to their new address. Then Mary carries out a traditional ceremony of handing over bread, salt, and wine as a blessing to the new home, while the Italian couple, depicted as simple-hearted Catholics, make the sign of the cross. The Italians are ethnic stereotypes, presumably included to emphasize that George’s America welcomes all good-natured peoples, of whatever race or faith. When Clarence rescues George from suicide, they tour the city of Bedford Falls as it would have become if George had never lived. Characters whom George knows to be kind and generous are—without his influence—coarse, selfish, and suspicious. The town has been renamed Pottersville, and its main street no longer contains mom-and-pop stores but instead sleazy dance halls, gambling dens, and bars where, as one character says, “men come to get drunk quickly.” It’s the kind of urban environment Protestant reformers had spent the previous century trying to clean up, most drastically by introducing Prohibition. George has prevented a reversion to the bad old days, not with fire-breathing sermons but with good-natured, civic-minded generosity. It’s a Wonderful Life is one of many religion “lite” films made in the forties and fifties, which now offer us a glimpse of the era’s revival and a lesson in thinking of the American way of life as almost sacred. No wonder it’s so popular. You don’t need to be religious to love the lovable characters and hate the hateful ones. Its message is that America is good, and that its unsung heroes preserve and protect it from the forces of darkness. To those characters, the nation’s ordinary millions, it says: Count your blessings—they are abundant. Patrick Allitt teaches American History at Emory University. He is the author of seven books, including Religion in America Since 1945: A History. 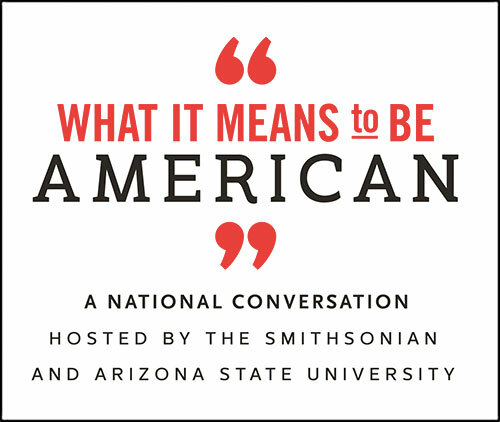 This essay is part of an Inquiry on It's a Wonderful Life produced for What It Means to Be American, a project of the Smithsonian’s National Museum of American History and Arizona State University, produced by Zócalo Public Square.